The emergence of the Calgary Flames as a top team has been one of the major stories of first half of the 2018-19 National Hockey League season. After missing the playoffs in 2017-18, the Flames are well-positioned to return to the post-season. But as the saying goes, there’s no point of just making the playoffs unless a team can make some noise once they’re in. The Flames are an impressive but imperfect hockey club. Here are three things they need to shore up between now and the end of the regular season on Apr. 6 if they wish to become Stanley Cup contenders. The Flames have gotten a lot of offense from the top end of their roster: Johnny Gaudreau, Sean Monahan, Elias Lindholm, Matthew Tkachuk and Mark Giordano. Those five players have given the Flames key scoring at key times, which has staked them to their current spot in the standings. That said, the Flames have been called a top-heavy team and that’s still true – though their “top” group is slightly larger than in previous seasons due to the emergence of Lindholm and Tkachuk as reliable scorers. #Flames F Johnny Gaudreau has 89 points in 2018, 19 more than any other Calgary player. The bad news is the Flames haven’t gotten a ton of scoring from the likes of Sam Bennett (six goals), Mikael Backlund (six goals) and James Neal (four goals). The good news is while the team’s secondary scoring has gone cold, they’ve still been scoring a lot – they’re sixth in the NHL in goals scored per game. 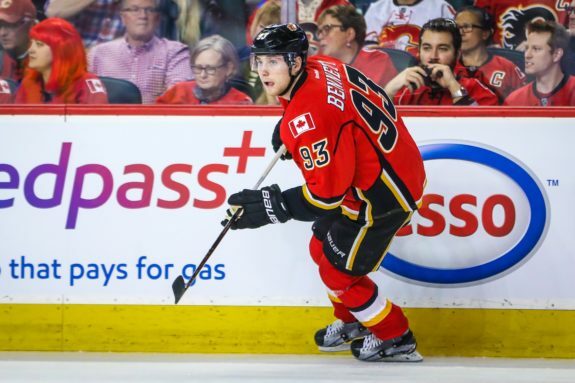 It’s inevitable that their primary offensive weapons will quiet down and when they do, the Flames will need their secondary guns to pick up the slack. If they don’t, it could be a short spring for the Flames. Mike Smith is 36 years old and hasn’t been amazing in net for the Flames, though he has had flashes of brilliance. David Rittich began the season as his backup, but has really taken the reins as the team’s de facto number one netminder. The big difference between the two goaltenders has been consistency: Rittich has been consistently effective, while Smith has been all over the place. Here’s a comparison of each netminder’s starts, sorted by the number of goals against they gave up per start. Whether Rittich has performed better than Smith is a matter of opinion – the stat lines certainly point in that direction – but he definitely has been the more consistent goaltender, with fewer starts with 4 or more goals against and a lower average goals allowed per start. There are fewer pronounced peaks and valleys with Rittich, which undoubtedly makes the coaching staff rest easy when he’s in net. The Flames need consistency in net and they’ll need two consistent goaltenders if they want to make it to the post-season and make a big splash once they’re there. Rittich is consistent. They need improvements from Smith for the stretch run, or they’ll need to find another netminder to complement Rittich. The Flames are the best third period team in the NHL. They’ve out-scored their opponents by a hefty 53-26 margin. While that’s an impressive feat, it camouflages that they haven’t been an amazing team in the first two periods. Phrased another way, the Flames are the best third period team in the NHL because they’ve had to be. Flames head coach Bill Peters has used the phrase “started on time” quite often this season, both in negative and positive contexts. When the team has a good first period, he has praised them. When the team has gotten down to an early deficit, he’s criticized them. The Flames have been out-scored 42-34 in first periods and 29-40 in second periods. They’ve trailed after the first period 14 times and after the second period 20 times. While they’ve managed to pull the proverbial rabbit out of the hat more often than most teams, they really can’t run the risk of using up their third period magic before the games really start to matter. Simply put: if the Flames were as good in every period as they are in third periods, their lives would be a lot easier and they’d be closer to become a sure-fire Stanley Cup contender than they’ve been in decades. If the Flames can smooth out the rough spots in their in-game consistency, they could truly become something special.